Sounds like a title to an old movie like The Creature From the Black Lagoon. The creature from Job is an interesting creature. But there are a lot common creatures that are interesting as well. I want to talk about them first. I used to have a large friendly dog named Char. I miss that dog. But on a very hot day when Char would pant (and always on me) her breath would feel very hot. I would tell my wife that it felt like a furnace. That’s what happens when you have a large warm blooded animal that pants to keep cool. And on a cold day it would look like smoke was coming from her mouth and nostrils. Another thing I find interesting is the way a cat’s eyes would glow at night because the way it reflects light when it’s dark. Or the way a fire-fly or lightning bug lights up at night. Well enough of that. Let’s go check out The Creature From Job. (imagine drama type music here) This creature called a Leviathan and is found in Job 41. Some say it’s a mythical sea monster. Some say it’s a crocodile. Some say it’s a dragon or some other mythical creature. If you read Job 41 you will see that it was written in the present tense. This is an eye wittiness account. Job 41:1-10 makes it sound like a very tough and ornery animal. But what does this thing looks like? Job 41:12 says it has enormous strength in its limbs. 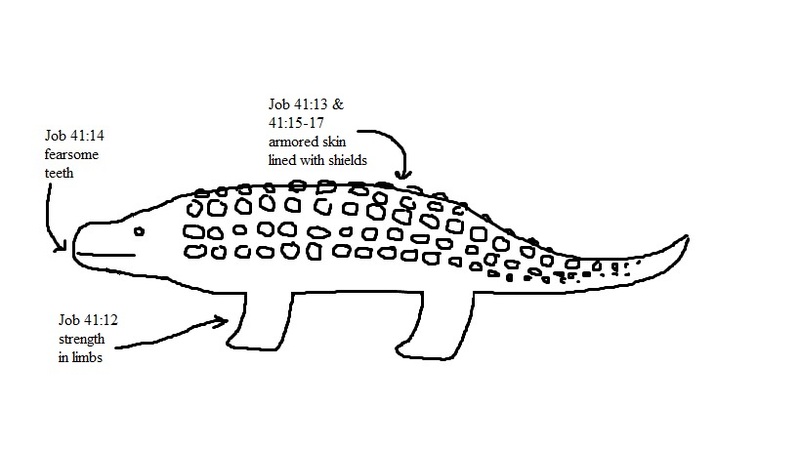 Job 41:13 and Job 41:15-17 mentions armored skin. Job 41:14 its teeth. So the animal should look a little like this. Looks like an odd creature. (I never claim to be an artist.) About the limbs; horses are powerful animals, but you wouldn’t say they have powerful limbs. A bear however; does have powerful limbs. You can see the strength in their limbs, in their front claws. A turtle also has power limbs. This is why I drew this thing with short, stocky legs. When I was researching this animal I didn’t know what the teeth looked like. I found on a website that said this didn’t have any grinding teeth but instead had ‘leaf type teeth’. Well leaves are flat and thin, so does this mean that this animal had flat and thin teeth? If so, then they could be like round knives. As far as the armor goes, well armadillos have that. No big deal there. I am a little disappointed that tail was never mentioned. When I first drew this I did it with a thin tail and again with a thick tail. In the drawing here I used a thick tail. You’ll see why soon. There is one more obvious physical characteristic, and that is Job 41:30. In the New Living Translation it says, “Its belly is covered with scales as sharp as glass. It plows up the ground as it drags through the mud.” New International Version says, “Its undersides are jagged potsherds, leaving a trail in the mud like a threshing sledge.” I decided to see what the Hebrew said. However the software I’m using doesn’t have Job 41:27-34. I have no idea why. 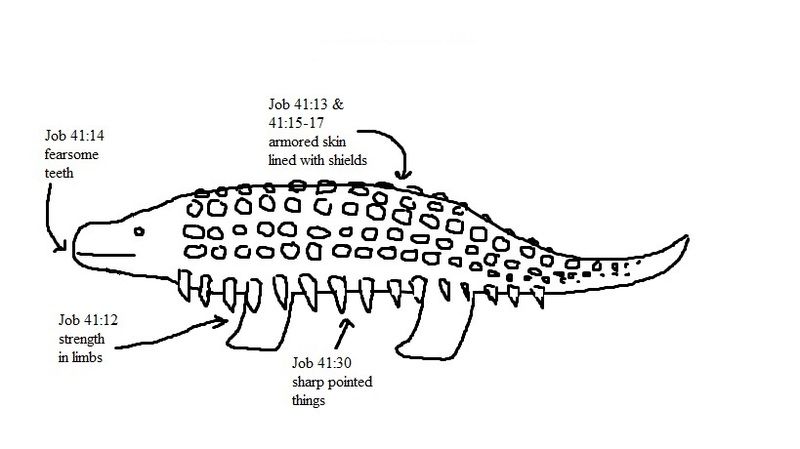 King James Version says, “Sharp stones are under him: he spreadeth sharp pointed things upon the mire.” So let’s put sharp pointed things on our animal. Hey this looks like could be an ankylosaurus! Let’s see what else we can learn about the ankylosaurus. In verses 22 through 29 basically says nothing can hurt it. Fact number 4 of a dinosaur fact website confirm this. Verses 31 and 32 suggests that it spins time in the water. Fact number 7 of a dinosaur fact website says the ankylosaurus lives in near-tropical climate. It also says that a cold blooded creature. However verses 20 and 21 suggest that it’s warm blooded, the same way I told you about my dog earlier in this post. If you Google warm blooded dinosaurs you’ll get a lot of possibilities. Also I know for a fact that it can often get down to the 30’s in the near-tropical climate of the southern states. You can see your breath sometimes in the deep south. Now about the fire in verses 18 and 19. Now I’m just guessing of course, but what if its saliva has glowing properties like that of a lightening bug or firefly? That might explain what could look like fire and flashes of light at night. But like I said, I’m just guessing here. And of course the eyes would glow like that of a cat. Evolutionists claim that ankylosaurus became extinct about 65 millions years ago. Yet when I tried to find out when they believe man evolved… well I don’t believe they really have an answer. I got dates from 10,000 years for modern man to 100 million for the earliest, primitive sub-humans. Evolutionists seems to have a problem about what they claim and what the Bible says. Remember Job 41 is an eyewitness account of seeing an ankylosaurus first hand. And not only that, but mankind was not a bunch of knuckle-dragging sub-humans. Let read Job 41:6 “Will merchants try to buy it to sell it in their shops?” You can see they had a civilization. And if that weren’t enough, read Job 41:27 “Iron is nothing but straw to that creature, and bronze is like rotten wood.” Did you get that? These people worked with metal! They weren’t that primitive. If this isn’t enough for you check out what God said in Job 40:15-17. There is only one creature I can think of that have a tail like a cedar, and you’ll never find one living anymore. OK, now let’s see if we can warp your mind. (If it’s not done already) All through the ages mankind have been using animals to do hard work. In North America we have used horses to pull plows. I understand that in some countries they have used elephants to do logging. What if, just what if long ago people used dinosaurs to move very heavy things. We have already seen that man and dinosaurs lived during the same time. What if it was possible that they used dinosaurs to move very large and heavy stones? What if they used these stones to build the pyramids in Egypt? Honestly I don’t known if they did this, but it is possible. Isa 27:1 calls him the “serpent” and “the dragon.” Later, in Rev 12:9, we’re told definitively that the “dragon” and “serpent” is Satan. It’s very possible that there was a creature that had some of the characteristics described in Job, but we can’t miss the ultimate picture that’s being painted- that the description is ultimately of Satan. Interesting. I agree Satan is referred to as a serpent or a dragon. I looked up Job 41:34 by itself in several translations as well as in the Hebrew, and it does sound like the Devil himself. But when I look at it with the rest of the text, it sounds like the nature of an animal. Example, dogs typically want to please their owner, while cats want to be pleased. Looking at it in context, it still sounds like an animal to me. Thank you for your feedback because it makes me think.